“When we think about the power of technology and if you think back 20 years, the idea of dial-up internet and what that actually allowed learners to do versus now where it is just ubiquitous for us to be digitally connected, is an immense shift,” said Erin Smith, Assistant Vice President of Online Experiential Learning at Northeastern University, in a Blackboard white paper. The digital classroom and technology have made opportunities for students in ways that the physical, brick-and-mortar institutions haven’t quite been able to achieve on their own. Bringing different technology solutions into the classroom has helped increase engagement among students, deepening their understanding of the subject matter and encouraging collaboration among peers. “When we think about the power of technology and if you think back 20 years, the idea of dial-up internet and what that actually allowed learners to do versus now where it is just ubiquitous for us to be digitally connected, is an immense shift." Educational institutions are incorporating digital signage, video walls and interactive displays in K-12 and at the college level, because of the apparent impact that these technologies have on students. A 2015 research project titled, “Digital Signage: An Experience of Innovation in Higher Education,” looked at the outcomes of education opportunities provided by digital signage, and it showed that students reported “above average” results when it came to collaboration with their colleagues. "Digital Signage channel encourages collaboration among students, university and administrative staff from different areas." “The overall assessment of the project is positive on [the] basis of the questionnaires, as the creation of a Digital Signage channel encourages collaboration among students, university and administrative staff from different areas, because it sets the outcome of the assignments in open environments,” wrote the study’s authors Vanessa Roger-Monzó, et al. Once the project was done, students were asked to complete a questionnaire. The questionnaire was based on a five-point Likert scale, which asked 14 questions about the students’ attitudes toward their educational outcomes. Concluding the study, the authors noted that students felt more engaged and encouraged to collaborate with one another, which led to higher satisfaction with the institution overall. Similar outcomes can be seen with interactive whiteboards in breakout rooms or in the classroom, because they give teachers and students a convenient way feature dynamic content. These interactive displays also give teachers a centralized way to accommodate all learning styles. “The best education technologies enable teachers to do more with fewer resources,” wrote Darrell M. West, founding director of the Center for Technology Innovation, and Joshua Bleiberg, a former research analyst with the Brookings Institute. Using technology at a classroom level is one of the foremost ways to solidify its presence in an educational environment. For K-12 and higher education, integrating personalized displays, like iPads or tablets, and feature displays, like an interactive whiteboard, brings students closer through a shared connection and a means of collaborating in a way that’s natural to them. “The best education technologies enable teachers to do more with fewer resources." In this way, students have the ability to take on a more active role in their education. By working with others on an interactive whiteboard or display, active learning principles come forward, allowing students and teachers alike the opportunity to dive deeper in the lesson and to learn from one another. 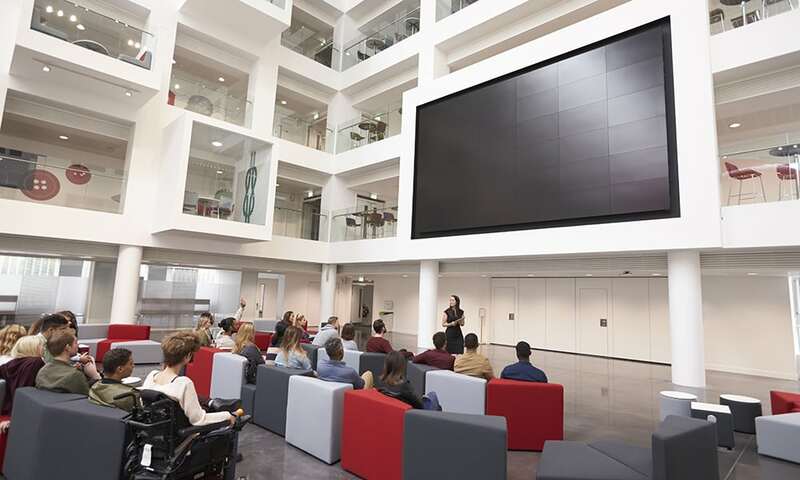 Outside of the classroom, large video walls will often feature content that engages, entertains and motivates students, while also serving as a way to broadcast news and messages around campus. Information and promotions can be featured here too, given the flexibility that comes with updating and displaying content ubiquitously. Digital signage and other technology solutions can yield higher student satisfaction, stronger engagement, and a cohesive environment. The way learning takes place has changed considerably over time, and with the help of technology, it’ll continue to change and improve outcomes for students and teachers. Editor's note: This blog post was originally featured on Visix's blog.